This past week, Trademark Theater not only opened a new production but also introduced themselves to the Twin Cities Theater scene. Trademark Theater is a new theater company that is founded by Tyler Michaels. 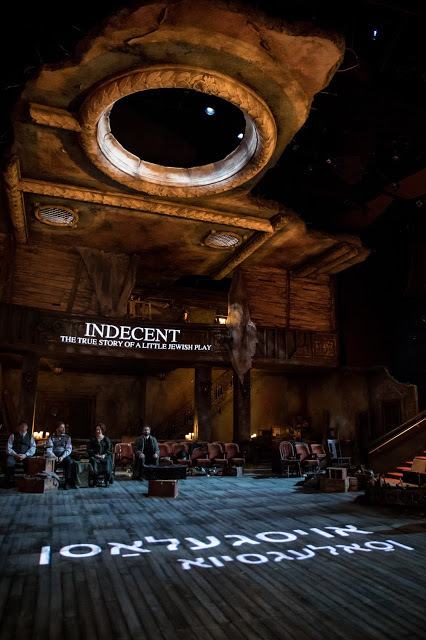 Their mission is to "[expand] the breadth of original theatrical works born in Minnesota by creating, developing, and producing dynamic stage productions." Not only is this a new theater, but this was the world premiere of The Boy & Robin Hood (written by Tyler Mills) and I enjoyed every minute of it. Their are countless of stories about Robin Hood and his Merry Band and Trademark even puts a timeline in the program which is certainly an interesting read before the show. This new interpretation and story really focuses on the fact that Robin Hood is a man. He is a person and has the same feelings and emotions as anyone else. The story involves a young boy who enters the forest as he is running from the King's guards. He searches for Robin Hood, the Merry Band and eventually joins them. In this version of Robin Hood, we don't see Robin as the main character but the boy, named Much, and we see the world through his eyes. My two absolute favorite parts of the production were the music and the movement. While may not be classified as a musical, it was certainly a play-with-music. 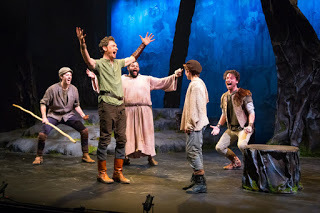 The music and lyrics by David Darrow at times were playful as Robin, the boy and his merry men danced around but at other times it was ominous and almost dark as the boy ran away from the King's guards. The intricate folk-like like harmonies and beautiful blend of voices, sang mainly by the ensemble, had me frantically looking in the program for any information on downloading the songs for my own personal enjoyment. You can hear one of the songs titled "May Day" on their blog located here. There was a variety of movement including choreography by Tyler Michaels and fight choreography by Annie Enneking. It was all exceptionally well done as the actors effortlessly glided across the stage. During one particular fight scene, each actor had their own fighting partner and at times would switch around to other people. It was a true sign of how tight-knit and in tune with each other this ensemble was. Each and every actor was superb in their own way especially "the Boy" played by Peder Lindell. It is always refreshing to see a young actor play a role in a show that deals with fairly mature themes. The rest of the cast were all superb. Often, for me, a sign of brilliant acting and wonderful theater is when I ask myself "Was I completely engulfed in the show?" and I was. The entire time I was so memorized by their performance that I often forgot I was watching a play. It sounds cliche and corny but it's true. If an actor can become so convincing that they transport you out of that space, they've done their job. TradeMark Theater's inaugural production has solidified their spot as a theater to watch in the coming years. The Boy and Robin Hood has the perfect balance of humor, heart, and tragedy. I'm thoroughly excited to see what else they do in the coming years. This show runs through June 11 and tickets are available here. More information, cast interviews and the process can be found on Trademark Theater's blog located here.